I've written on packing a lunch before. You already know how I feel about leftovers... Love 'em! For these tips to work out pleasantly, you should have access to a refrigerator or use ice packs! 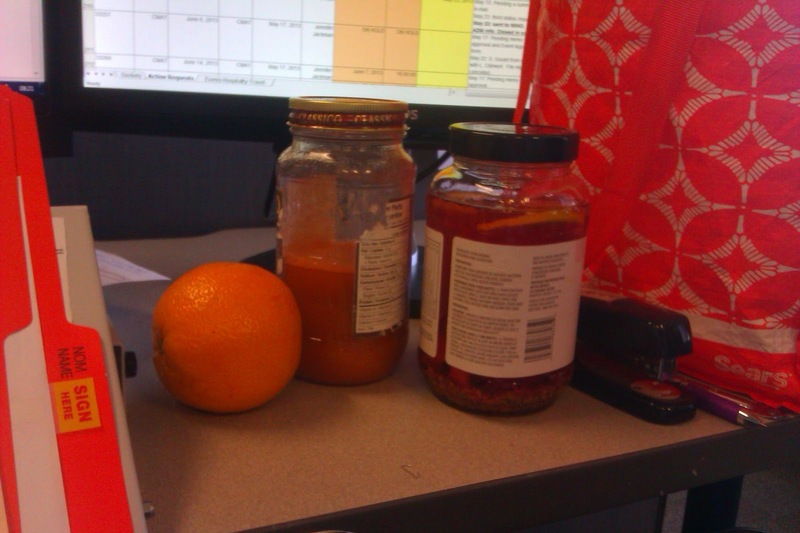 Today I am offering ideas on maximizing rawness in your lunches away from home. My first recommendation is to always have a variety of raw nuts and seeds to munch on when hunger strikes. When the body says "feed me" it is usually because it's time for protein. These are easy to store in a bulk quantity at the office. 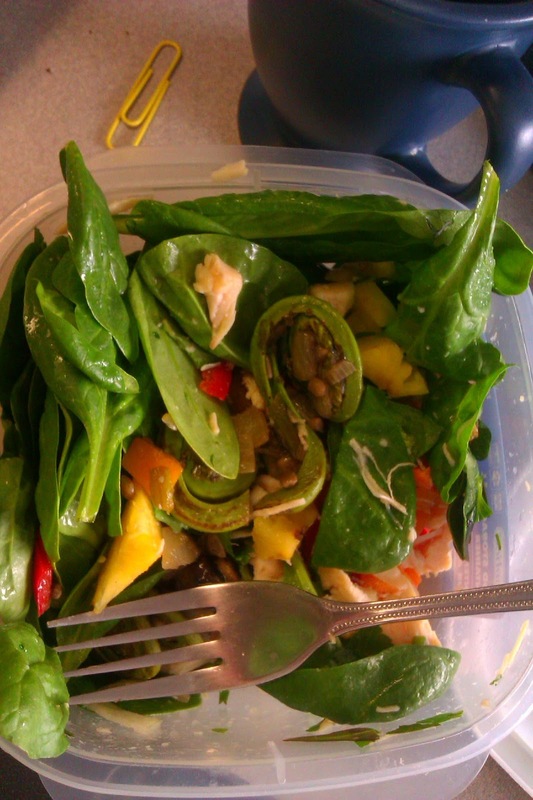 I keep a container of hemp hearts to add to salads, yogurt as well as to hot dishes. Other things to keep at the office for convenient lunches is your own cutlery, some dishsoap and a sponge or washcloth. My packed lunches almost always include salad with lemon, homemade dehydrated crackers, raw vegetable juice or half an English cucumber and a fruit or two. It seems I'm always nibbling on something throughout the day. I focus on protein, variety, fresh taste and water intake. This way of eating can take time to get used to because it has high fibre and low sugar contents. It is low carb, yet high protein, minerals and vitamins. If you are having sweet cravings, add dried fruits to your afternoon snacks instead of breaking down and buying a donut. 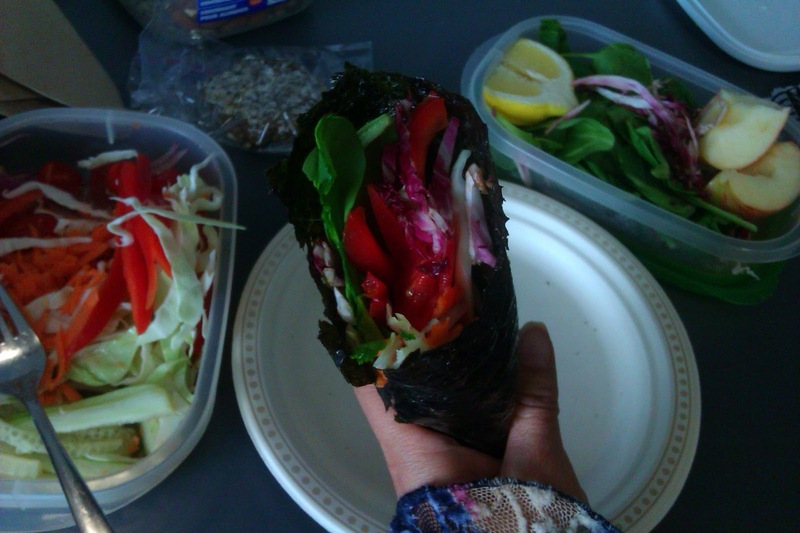 Some planning ahead is key to packing healthier lunches with more raw and whole foods but as I'll mention again, it does not need to be complicated. I don't like eating the same thing all of the time. If you bring variety, you will stick with your plan of avoiding excessive spending on toxic processed foods. It certainly takes some planning ahead but really does not need to be complicated. Not a diet, it's a lifestyle. This is homemade hummus made from canned chick peas and chives from my early spring garden. What I promote isn't a diet, it's a lifestyle and I suggest we strive to be conscious of what's in our foods and simply aim for the best. Even if we rely on processed foods such as canned meat or peas now and again. There are many raw hummus recipes out there on the web, although as Eric pointed out "I would just call them dips!" Zucchini (I don't peel it) blended with lemon juice, tahini, hemp hearts, olive or grapeseed oil, garlic, a piece of onion, of red pepper, a touch of sea salt and cumin makes a very nice "raw hummus". For a cracker spread that takes no preparation, bring an avocado and a butter knife. 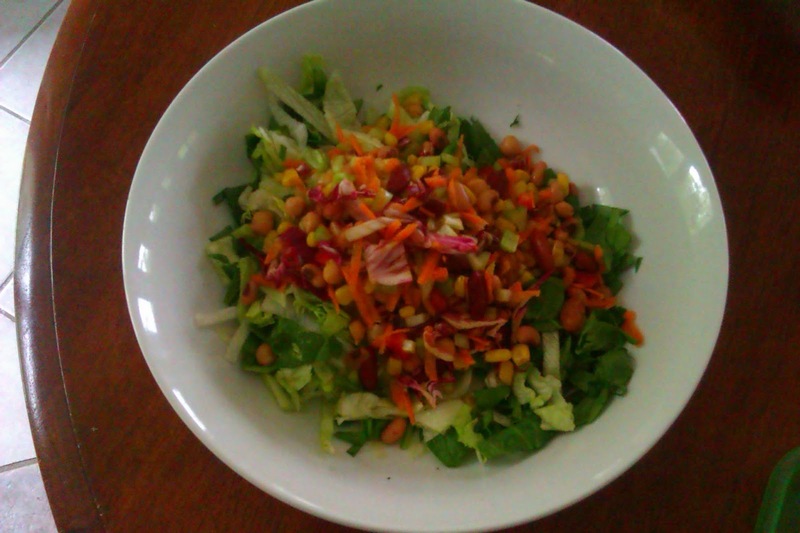 Make a big salad at dinner time, and put some aside for your next day's lunch. At home, I make amazing vinaigrettes usually with a mix of olive oil, raw apple cider vinegar, herbs or pantry spices and sometimes maple syrup or balsamic vinegar. My simplest and zestiest salad dressing is half a lemon squeezed over my salad right before eating! To go, I'll place my mixed greens in a container with the lemon and I no longer worry about creating oily, smelly, spillings. This salad pictured above is made with canned corn, some storebought salsa and cumin for a Mexican twist. Those are processed ingredients but they accompany spinach, romaine lettuce, raddichio, grated zucchini and carrot as well as raw onion so I think it is all worth the compromise. We must find balance between what works for us, our schedule, our dietary needs, finances and personal health regimen/preferences! If you consume dairy, add whole chia seeds to plain yogurt or cottage cheese, along with berries (fresh or frozen) and a touch of agave, honey or maple syrup. It will firm up like a pudding which makes it better to carry and gives a rich texture. The bonus is that buying the ingredients in bulk saves you money too. But that's not all, this is something you can prepare the night before. You can do this with soy milk too, (chocolate flavour or blended with berries!) add some probiotic powder if you want. Whole raw chia seeds can be added to smoothies, juices, salsas, jams and dips without affecting the taste but do change the texture, which I really enjoy. 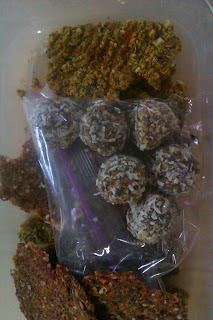 I often include chia seed to my dehydrated chacker and desert balls. It's a little seend with many healthful properties. When you are adventurous and building your skills at making dehydrator delights, bring some to share! Or at the beginning of the week, if you have access to a refrigerator at the office, bring a quantity of crackers and berry balls that you will have on hand for a few days. I do the same thing with soups which I bring in a glass jar and serve myself a microwaved bowl when I feel like having soup that week. I also keep a container of raw nuts to nibble on in the morning especially. At home, steep fennel seeds with freshly boiled water. Slip into tall glass jars, 4 to 6 frozen raspberries along with slices of ginger and lemon. Pour in the fennel tea, with the seeds. 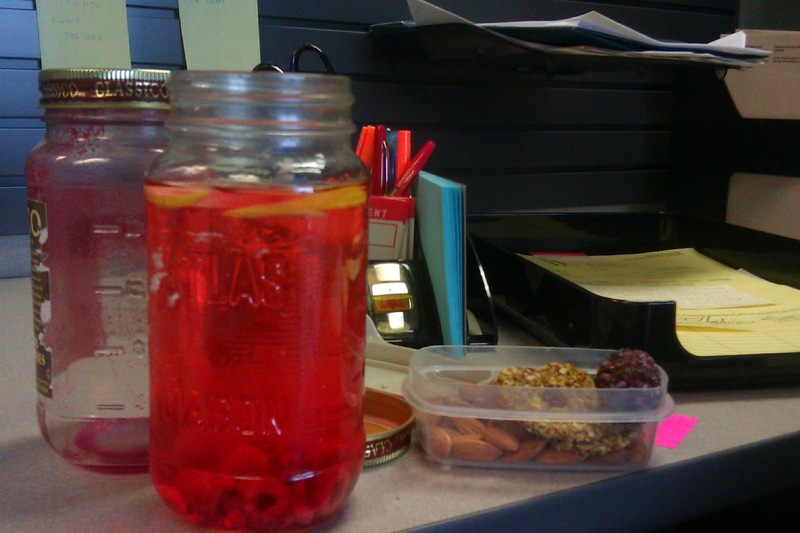 Top off the jars with filtered water and place them in the fridge until you are ready to go. I like to prepare 3 or 4 jars on Sunday night. If you're like me and don't want to drink fluorized tap water from the old office building you work in, stay well hydrated with fruit such as oranges, grapes and apples. Also bring kombucha* , homemage ginger ale or raw juice made that morning (or the night before - cover, avoid contact with metal and refrigerate for up to 12 hours as then it's already lost many nutrients with oxidization). If you don't juice or make green smoothies but drink coffee, you should seriously consider switching your coffee for a healthier kind that has antioxidant instead of acidic properties. You can purchase Organo Gold coffee from me here. The Supreme kind even contains ginseng. They already come in individual packages, you just need freshly boiled water and a mug. I haven't yet spotted raw nory (seaweed) sheets. Black ones are roasted and the raw ones are supposed to be green. They are an inexpensive food when you consider their nutritional value and that they can be a substitute for bread or tortilla wraps. I love rice paper wraps at home but they don't always carry well. So for your nori hand roll, thinly slice your choices of vegetables, my favourites include cucumber, bell peppers, cabbage, onions, Portobello mushrooms, lots of spinach, grated carrots and I splash with lemon juice. The edges of the nori sheet will stick to each other when dampened. 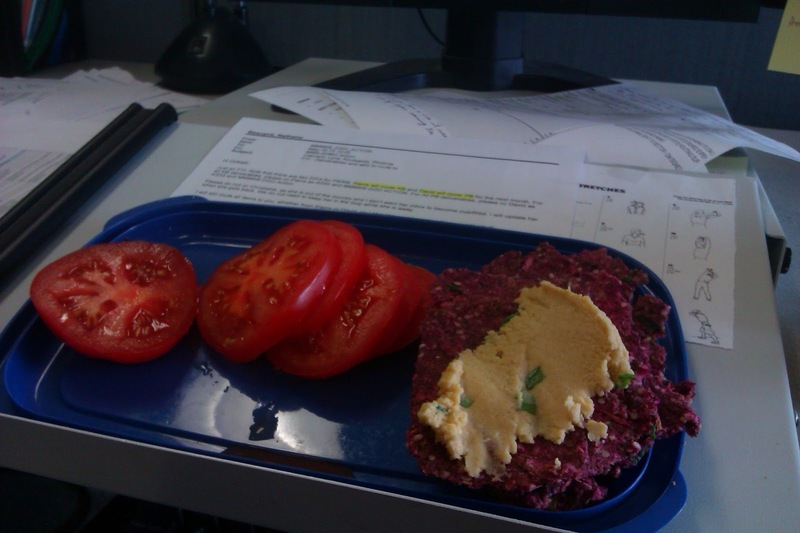 Note that similarly to a Big Mac or a Subway sandwich, this is something you don't want to eat over your computer keyboard. Leftover chicken stirfry with fiddleheads, chicken, peppers and onions topping fresh spinach, basil, chives and pineapple chunks. Give in to temptation - on your own terms! I was tantalized by buying a second salad today when my coworker announced she was going to the Greek place. 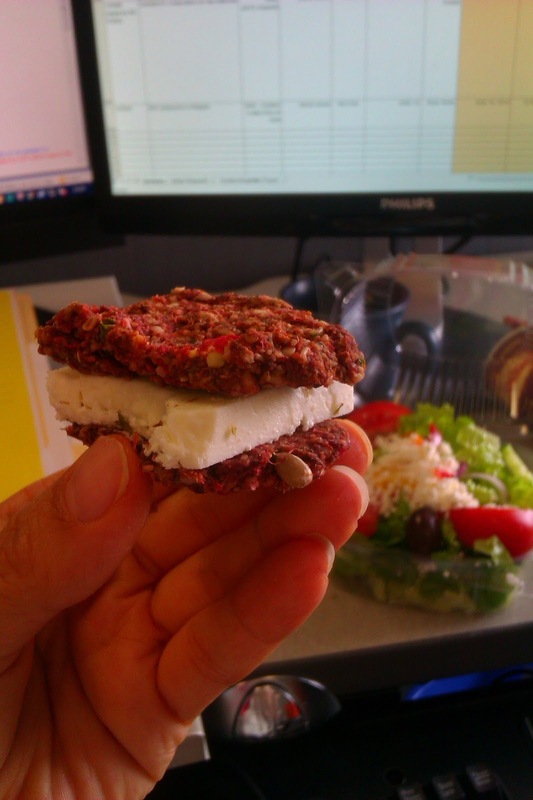 Bringing a lunch is frugal, reduces packaging so I say it's good for the environment but sometimes we just want a treat. In this case... feta. It tasted amazing with my dehydrator crackers. Also check out the eggplant marinade recipe that goes a long way... for healthy lunches! *kombucha posts will be coming soon! 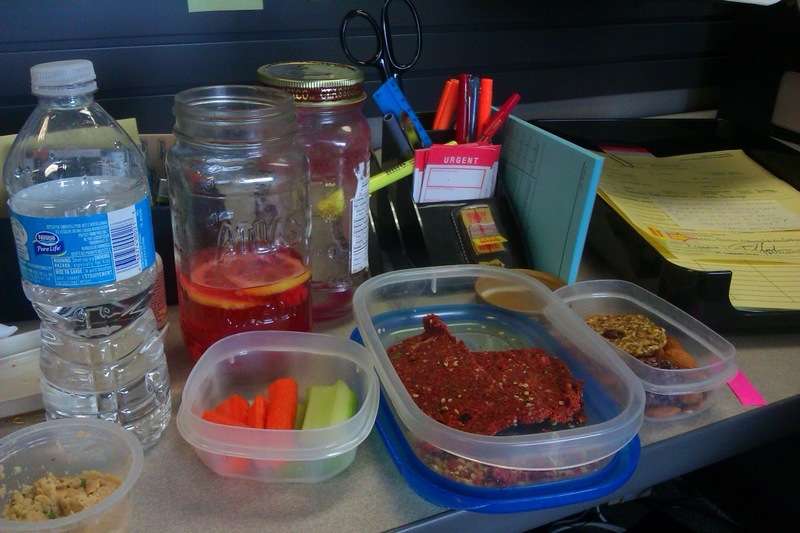 How do you pack a raw lunch?